At Fairhaven Health, we are committed to providing trying-to-conceive couples with a broad spectrum of tools to help achieve pregnancy. We offer products that help pinpoint ovulation, as well as dietary supplements intended to promote reproductive health in both men and women. Our most popular dietary supplements are FertilAid for Men and FertilAid for Women. These supplements were formulated based on the most current science available, and with the specific nutritional needs of trying-to-conceive men and women in mind. It is a well-established fact that sperm counts have dropped significantly over the last 75 years, mostly due to poor diet and chronic exposure to environmental toxins. And, a growing body of scientific research points to oxidative stress (damage to sperm cells caused by free radicals due to poor diet and exposure to environmental toxins) as a leading contributor to male infertility and to the role of supplemental antioxidants in reducing oxidative stress in the body. FertilAid for Men provides men with the antioxidant support they need to combat oxidative stress, and a comprehensive array of nutrients at levels that have been clinically demonstrated to improve sperm health. In fact, FertilAid for Men has been demonstrated in a double-blind, placebo controlled pilot study published in the American Journal of Andrology to exert that very effect. It is also well-established that ovulatory disorders are responsible for up to 15% of all cases of infertility in the United States. Endocrine conditions, most notably, polycystic ovarian syndrome (PCOS), produce hormone disturbances that lead to ovulatory disorders. FertilAid for Women contains a blend of herbs, including Vitex agnus-castus. Commonly known as chasteberry, this herb has been scientifically demonstrated to restore hormone balance and promote regular ovulation. 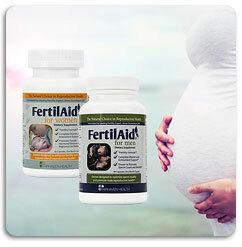 In addition, FertilAid for Women contains a full prenatal vitamin. The benefits of supplementation with prenatal vitamins are well-accepted…even the most skeptic critic of dietary supplementation cannot argue the benefits of vitamin and mineral supplementation for trying-to-conceive women. Should FertilAid be seen as a “magic bullet” for the treatment of male and female infertility? Absolutely not. Does nutritional and herbal supplementation play a fundamental role in male and female fertility? Yes, absolutely. So, the question becomes, is there a magical path to parenthood? Just like there is no magic pill for weight loss, or cancer prevention, or diabetes management, there is no magical path to pregnancy for couples struggling with infertility issues. There is, however, a rational path, which includes weighing the costs, benefits, and side effects of all of the possible options. What are the possible options for couples facing infertility issue who desperately want to become parents? Advances in modern medicine have given us an alphabet soup of assisted reproductive technologies (ART), including IVF (in vitro fertilization), ICSI (Intracytoplasmic Sperm Injection), and IUI (intrauterine insemination). Each of these technologies carries a significant price tag . . .one IUI procedure can cost up to $800, while one IVF cycle will cost at least $10,000. One might imagine that this great expense would be offset by the certainty of achieving the desired end goal. Not so. These expensive and invasive procedures, which are often accompanied by significant side effects, come with no guarantee. In fact, the chance of successful conception with IUI is approximately 10%, and it typically takes multiple IVF cycles before pregnancy is achieved. While skeptics of fertility supplements often imply that supplement manufacturers are preying upon the dreams of unsuspecting prospective parents, no mention is made of the medical establishment’s vested financial interest in continuing to provide this brand of high-cost, low success treatment to infertile couples. For just under $30.00 a month, FertilAid for Men provides a comprehensive multivitamin tailored to trying-to-conceive men, and includes extra amounts of key antioxidant nutrients that have been demonstrated to safely and effectively benefit overall sperm health. For just under $30.00 a month, FertilAid for Women provides a full prenatal vitamin and a blend of herbs that promote hormonal balance and cycle regularity in women. Magical? No. Rational? Indeed. Of course, not all people who take FertilAid get pregnant. There are those who take FertilAid faithfully, exactly as directed, who do not achieve pregnancy. But there are many other people who take FertilAid and do successfully achieve pregnancy – some in dramatic fashion after trying unsuccessfully for extended periods of time. And, somewhere in the middle are the hundreds of people that experience benefit from FertilAid, measured for women by changes in their cycle and for men by increases in sperm quality. Each year, thousands of FertilAid customers share their “success” stories with us by posting reviews on our website. We encourage you to read these genuine reviews from real customers. For scientific references supporting the benefits of the ingredients found in FertilAid for Men and FertilAid for Women, please visit the FertilAid site. This entry was posted in Fairhaven Health Library, Featured Articles, Fertility, Nutrition, Lifestyle & Supplementation. Bookmark the permalink.